We have a couple of pieces of "Depression Glass" that once belonged to Cindy's grandmother. This is a large green serving bowl which has been lit from above producing the sunburst effect around the base. Depression glass is clear or colored translucent glassware that was distributed free, or at low cost, around the time of the Great Depression. Canon 40D, 1/1250 sec @ f/2.5, ISO 400, 50mm macro lens lit by the Litepanel Micro LED. 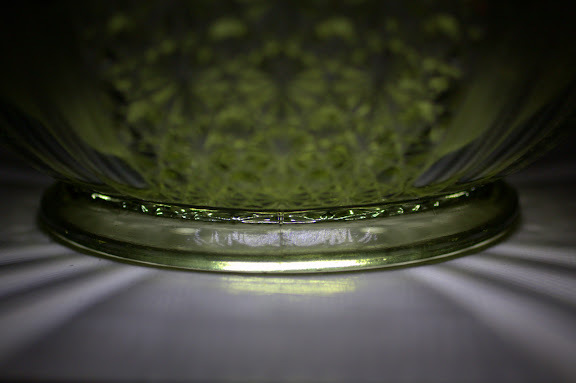 Interesing perspective on the Depression Glass. I like the starbust. Nice to see people using this kind of glassware in more "artistic" ways. They are beautiful pieces on their own, but being translucent makes them all the more interesting for photography projects. You have inspired me to try something similar. The Blimp - the Blimp!